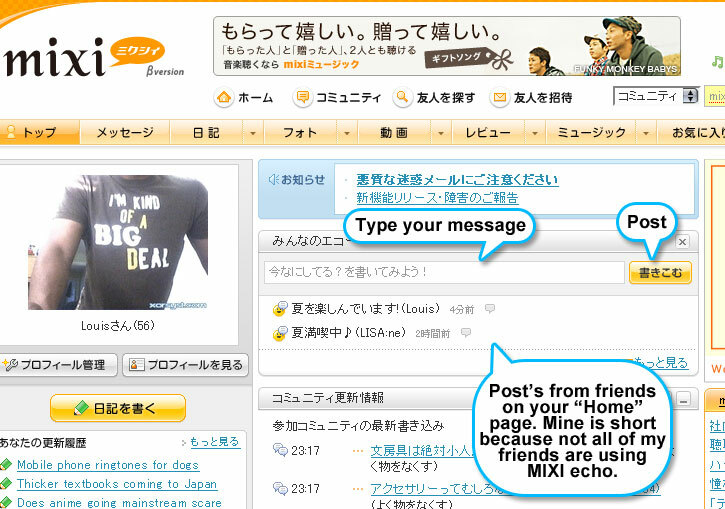 In an attempt to take advantage of the microblogging wave that is sweeping the world thanks to Twitter, MIXI has debuted their new service called MIXI Echo. Just like Twitter, with MIXI Echo you can type a short (150 character) message, and it will be broadcast to all of your friends using the service. What’s different about MIXI echo is that usually you can control who sees your blog post (friends, friends of friends), however with the MIXI echo service, your messages are on a public timeline (just like Twitter). It seems as though this is just a test of the service as the service page says its only available until September 1st. I’m interested to see how well this service does on MIXI. Be sure to add me on MIXI and Twitter!